Today, I’ve got an extra special guest on the show. He’s someone who I’ve followed and looked up to every since I started blogging in 2009 and that person is Jonathan Fields. Jonathan is an amazing writer, speaker, podcaster and he has this incredible ability to build community. What I also like about him is that he’s a family man we share a lot of the same values when it comes to life and business. In other words, he’s very mindful of balance and living a full life. Today, we are going to talk about the good life project and his latest book how to live a good life. Steve: You are listening to the My Wife Quit her Job Podcast, the place where I bring on successful bootstrapped business owners and delve deeply into what strategies are working and what strategies are not with their businesses. Today I have Jonathan Fields with me on the show. Now Jonathan runs the Good Life Project and he’s actually an entrepreneur that is near and dear to my heart, and in fact when I first started blogging back in 2009, Jonathan actually inspired me to write from a more personal level as opposed to just putting out strange ecommerce tutorials. In any case Jonathan is an amazing guy, so please enjoy the interview. Now before we begin I want to give a quick shout out to Klaviyo who is a sponsor of the show. Now I’m super excited to talk about Klaviyo because they are the email marketing platform that I personally use for my ecommerce store, and I depend on them for over 20% of my revenues. Now you’re probably wondering why Klaviyo and not another email provider. Well Klaviyo is the only email platform out there that is specifically built for ecommerce stores, and here’s why it’s so powerful. Klaviyo can track every single customer who has shopped in your store and exactly what they bought which makes it extremely powerful. So let’s say I want to send an email out to everyone who purchased a linen napkin in the last week, piece of cake. Let’s say I want to set up a special autoresponder sequence to my customers depending on what they purchased, easy peasy, and there’s full revenue tracking on every single email. Klaviyo is the most powerful email platform that I’ve ever used and you can try them for free at mywifequitherjob.com/Klaviyo, once again that’s mywifequitherjob.com/K-L-A-V-I-Y-O. I also want to give a quick shout out to Privy who is also a sponsor of the show. Now what’s also cool is that I use and rely on Privy for both my blog and my online store. And what does Privy do? Privy is an email list growth platform, and they actually manage all of my email capture forms, and in fact I use Privy hand in hand with Klaviyo. Now there are a bunch of companies out there that will manage your email capture forms, but here is why I like and chose Privy. Privy is easily the most powerful platform that I’ve ever used, and you can trigger sign up forms based on any primer that you desire. So let’s say you offer free shipping for orders over 100 bucks, well you can actually tell Privy to flash a popup when a customer has $90 in their shopping cart to urge them to insert one more item. Here’s another cool use case, if someone has item A in their shopping cart, I can easily tell Privy to display a special coupon code for that item or display a related offer. In terms of email capture, I’m showing different email lead magnet depending on what product a customer is browsing in our shop. So bottom line Privy allows me to turn visitors into email subscribers, which I then feed into Klaviyo to close the sale. So head on over to Privy.com/steve, try it for free, and if you decide you need the more advanced features, use coupon code MWQHJ for 15% off. Once again that’s privy.com, P-R-I-V-Y.com/steve, now on to the show. Steve: Welcome to the My Wife Quit Her Job Podcast, today I have an extra special guest on the show. He is someone who I have followed and looked up to ever since I started blogging in 2009, and that person is Jonathan Fields. Now Jonathan is an amazing writer, speaker, podcaster and he has this incredible ability to build community. And what I also like about him is that he’s a family man, we share a lot of the same values when it comes to life and business, and in other words he’s a very mindful person about balance and living a full life. I remember back in 2008/ 2009 I was going through an entrepreneurial crossroads and his blogs at the time Career Renegade and Awake at the Wheel were ones that I read whenever I needed a pick me up. So just for fun I looked at my email archives and I found an email dated November 4th 2008 where I reached out and wrote him a fairly long email about my story, how my wife wants to quit, how I want to start a business, how I want to spend time with my family yaddi, yaddi, yadda, and he replied with a one liner, thank you for your email. And I was like yes Jonathan Fields replied to my email, and later on he actually sent me his book Career Renegade as well and I was stocked. Anyway today we’re going to talk about the Good Life Project and his latest book on how to live a good life, and with that welcome to the show Jonathan, how are you doing today man? Jonathan: I’m doing really well, now I’m feeling so guilty about my liner back in 2008. I’m like it’s fine with me because that was a time I think I remember where I was really – I was just very newly aligned and very newly public and I just – I was like how do I deal with this bandwidth thing and how do I – so I started taking a nod from Seth Godin who basically responds to most emails but generally it’s never long, I think it’s three to five words and look it’s good enough for Seth it’s got to be good enough for me. Steve: Hey you know I was just happy to hear from you, you know those five words were powerful. Steve: So Jonathan I know your work well but for the benefit of the listeners can you just tell us what the Good life Project is all about and actually if you won’t mind what happened to Career Renegade, because I must have missed some memo long ago? One day I went there and it was just gone. Jonathan: Oh the website you mean? Jonathan: You know it’s interesting, I’m not entirely sure, so there were two things that happened. One is that we launched that site at the same time that the book launched and started to feel that is something separate. Then is realized pretty quickly that I just didn’t have the capacity to be building content on that website and also blogging, this is in the very early days where it was really just me and a desk, I had no help and no team. Jonathan: So we folded — I made an announcement back then and I said, “Listen, we’re merging the content site of Career Renegade into what was then my blog which I called Awake at the Wheel and we put it all on to my main website at jonathanfields.com and which kind of intervened there. And then I stopped refreshing and updating careerrenegade.com and I didn’t pay attention to it and I noticed, I don’t know but it was either a month or a couple of months, it could even have been a few years later that I just clicked on the site and I noticed that it was somebody else. Something must have happened where the URL expired, I never got notification, somebody was sitting on it and immediately grabbed it up. I had no idea because I hadn’t launched a long time but they had even stolen some of my graphics and the load on stuff like that I had put up there, but fundamentally it was designed just for the book and when I realized that I really couldn’t store two different properties I folded the main part of that into my personal website at the time. Steve: But today you have jonathanfields.com and you have goodlifeproject.com as well, right? 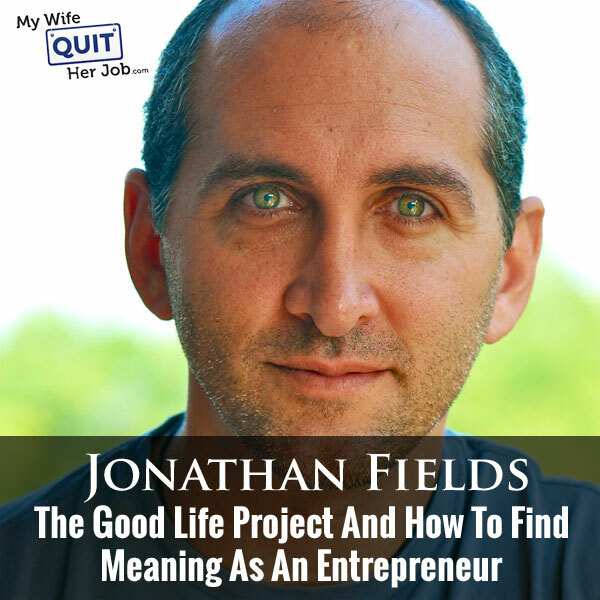 Jonathan: I do yes, Jonathan Fields is where I decided to do some of the longer essay sound writing, and it tends to be less frequent, and Good Life Project is really where most of my focus is, most of my energy is since the beginning of 2012, and here you’re asking what in the world is Good Life Project. There are two ways to look at it, one is sort of on a bigger picture, it’s we’re on a mission to inspire, support and educate people in the quest of living a more connected, more meaningful, more lit up lives. And one layer deeper that takes the form of media and education venture where we produce media video to audio podcasts, where we create and produce courses and events, experiences, everything from centered on our courses to a once a year annual summer camp for adults where 400 people get on plane trips and obviously not allowed to take over [inaudible 00:07:57] and then build the community. It’s really built around this idea of establishing a clear set of values and beliefs ethos, and then sharing that and other things and saying, hey you see the work of this, when you see it come join us and we’re assisting each other. Steve: You know what I love about the Good Life Project is that everything you do, the production quality is just always amazing, and then the guests that you have on, they just have so much depth, and what I really like about what I’ve seen so far is that money is never the focus. What I was hoping to do and just to start out with was if you can give the audience an example of one of your favorite guests, and why they particularly resonate with you, that would be great. Jonathan: Oh man yeah you’re right money is never the focus, it’s an interesting measure, brought so much rejection that is actually not the measure and it’s a [inaudible 00:08:50] indicator and not only an indicator of a life well lived. So many incredible guests over the years, [inaudible 00:08:56] we kind of like it really it just clicked like more of lost friends and she’s such a – so, so awesome and deeply bright, her life is so open and so utterly herself. What I love I think most about her is that she is unapologetically her; there is no herself that you have to wait, if something is on her mind she will tell you, and she will tell you just so you see her there. She’s also deeply wise, she’s a researcher, she does a lot of theory research and seeing the vulnerability and courage. So I read that she runs a real academic writer with her ideas and she actually loves the world. And interestingly similarly, but really similar in that she’s also unapologetically herself [inaudible 00:09:49] is the author I deeply love and [inaudible 00:09:51] really just had a fantastic nature of her love treatment on the world, and she’s actually a person with [inaudible 00:10:25] also but instead of deep academic writer, she’s unapologetically like a guru as well. She believes that ideas exist in the ethos and plenty of things and are just looking for people to come and touch reality from out of us. So I love the sort of like really pull her ox, it lands on so many things but at the same time deep and shared values there and also just a willingness to stand out and say this is who I am. Steve: Yeah that’s the common theme of all of your guests and then here’s what I always get. The people that tend to be the happiest tend to be those who don’t hold anything back, they just act themselves, and that’s what I love about the guests that you always bring on, it’s just amazing. Jonathan: Yeah I think that’s true and I think that’s probably one of the things that we keep want to talk to them is because I know that we’re going to have a real conversation, and what’s interesting is most of my guests also are a bit further into life, so very often they’ve been through enough on their struggle, enough challenge that they can shake in some way to starting really looking at what matters on the people that will start to let go some of the posture and position that all of us are journeying on to essential times of our lives and interested in that process of letting go and are interested in how people move into through that to that better place. Steve: So Jonathan I actually know your back story pretty well, but just for the benefit of the listeners who might not have heard of you before, can you kind of tell us what kind of events led you to create the Good Life Project, and why you think the way that you do today? Jonathan: Yeah so depends how far back do you want me to go? Steve: Well you were a lawyer and you – yeah. Jonathan: So I was a [inaudible 00:11:45] kid. I’m really like an entrepreneur, I took this weird left turn and I went to law school. I had actually barely attended class in college and I just got my first sort of legitimacy in college which I saw at the end and I got really curious about what I was into actually [inaudible 00:12:03] because I knew I hadn’t really tested that in any way in college. So after taking a little bit of time off I went to law school and with the intention of just really focusing and seeing what [inaudible 00:12:14]. I was very fortunate, I did very well, graduated from my class and then to a great opportunity. So I ended up practicing law first at the security and exchange commission with Federal government which was a whole interesting trip. Now something like 20 years later I’m just finally able to actually start to talk about some of what really happened because we were on this barrel of sequences for a long time. And then I went to [inaudible 00:12:39] and I went and became a deal lawyer in the securities for a mega firm in New York where we were going to hedge funds and the best being ridiculous and that’s money and doing all this creating this in. Then I ended up basically [inaudible 00:12:54], I was making a ton of money, I had the power, the prestige that so many people often desire to and I was dying inside and literally dying inside, because I ended up in emergency surgery after my system shut down. A huge infection was munching in the middle of my body, ended up going through many tests and so not believe everything is okay but it was a wakeup call for me and it certainly be that much promotion. I had a lifelong interest both in entrepreneurship and inside of my body conviction and also in the speaker question, once you need to be your life that lived well. So that took me from being a lawyer to making 12 bucks an hour as a professional trainer because I wanted to learn the health and fitness in this trip [ph] from the ground up. Nothing matters from the middle down but from the ground up what was really happening and where were the gaps that all of a sudden I thought I could solve, and actually did get a whole bunch. From there I ended up launching my first facility through that, after about two and a half years sold my interests to an investor here to do a little time off to [inaudible 00:13:57]. And then opened the other CDM in Hellskitchen [ph] New York City because I was getting really interested in yoga, and I saw again a gap I saw in me that wasn’t being filled. I at that point was married, I had a home, I had a three month old baby girl, and I signed on a lease specifically on the first floor on the building and actually the day before 9/11. That led me into quite an odyssey in there and really questioning everything and dealing with the intense feelings that broke within the city. We had gotten to moving forward in launching that center and it became this beautiful solution committee where we ended up with thousands of students from all over the world and training so many teachers to go out into the world [inaudible 00:14:46]. Jonathan: Yeah the first year was brutal and actually there were some really big missteps that I made, everyone talks about their successes, I screwed that left and right. This was the most real atmosphere that you can ever try and open and build a business in, and we identified the fact that entrepreneurship especially to traditional brick and mortal where you have a physical facility, you have inventory, you have employees, you have all these people coming to assess, this is just a really hard and fraught and super challenging. I remember sitting on a coach probably about a year into it with my hands just beating myself, I just want to know is this going to work or it isn’t going to work. Just give me a sign, I almost there was a window I probably I almost didn’t care if I succeed or fail, I just wanted some certainty. Every entrepreneur gets through that even the most successful, we all had windows of time where it’s up, up, up, up and then we’re like, okay for me to push to the next level, I’m going to have to sit back and into that sit of uncertainty again and I don’t know what’s going to happen. If you never do that, then you end up going sideways and actually not backing up. So I went through that in the early days for sure, then later we know the deep emotion on top of that and what we were building and the fact that we were building functionally what I call a business of belonging, a business where we’re building, it was based on a community and inspiration to elevation and providing source of belonging for people and it was really powerful and at the same time very challenging. Steve: Are you still running that studio today? Jonathan: No, it ended 2008. So right around the time that you found me actually, so I guess it was at the end of 2007 I started to really become interested in writing, and I decided to sell my first idea for both [inaudible 00:16:54] so it was written on it and I kind of knew at that point that I was starting to be more checked out in this physical business and it wasn’t fair. I had a great management team, at that point we were really flourishing, we were doing well, we were established for seven years, but I knew it wasn’t my future and I also knew that because it was based largely on community, the community needs somebody who cares as a leader and I was checked out. I cared but I wasn’t really super invested any more, I wasn’t their commitment either. So I think 2008 I sold the entire company and I started as this small fellow on writing, and speaking and building business in the digital space, which I did and made some different iterations, got enough growth and then actually everything kind of came together. The company and this thing called Good Life project in January 2012 which literary started as an annual refreshing blog post [inaudible 00:17:54] what I want to do. That turned into a 40 page designed annual report which I kind of released that into the world and that thing kind of took off in its number is 100 times. At the end of it I pieced this thing called my ten commandments of that big business and also this thing called Good Life project which I didn’t honestly know what it was going to be. But I just knew that I want to create something, and I knew that I wanted to produce me at a completely higher level and take my quest to learn from other embodied teachers and turn it into a more mature business in my location, and be able to turn around and share what I was learning. Steve: You know what’s interesting about your story is that I get emails from readers and listeners that they’re going through the same thing. They start a business and they might be doing really well, but they’re just not happy and on the flip side there is also people that feel stuck at their jobs but they aren’t happy either. And so I know your latest book kind of covers this and I was hoping we can go through this a little bit, what is missing with these people and how do you figure out what’s going to make you happy? Jonathan: Yeah, so one, feeling happiness is the wrong nurture. We get our purpose obsessively on happiness and as you can hear in the background by the way I’m near [inaudible 00:19:19] actually so you can hear the occasional siren and this is legit MRC, so you’re getting the full experience. So happiness is great, happiness is something that we all want to experience, happiness can also – when you focus on like making that a primary metric for your living a good life, it can actually make you less happy, because everything you do you know like I’m happy, I’m not happy, I’m happy. We start to realize that a lot of times you’re not happy but here’s the thing, nobody is happy all the time and try to actually – when you set yourself up for I just want to be happy all the time, you set yourself up for failure. Happiness is a fleeting space; it snaps on your life, it’s not the movie of your life. When you try to make it the movie of your life, it makes you less happy than happy, you’re are going to try that, we also have genetic settings for happiness. So we’re not entirely in control of our happiness, so you will get somebody next to you who is giggling most of the time and you’re not that way we think well it’s my job, it’s my relationship, it’s something else. No probably it’s just your wiring and that’s okay. Be as happy as you can be. So I think the much more important metric that I’ve seen is a sense of am I doing something that lights me up, is it allowing me to use my strengths in a way that I feel strongly utilized, is it allowing me to use whatever natural gifts and talents I have in a way that feels like I’m competent and confident. Is it providing me a sense of true legal meaning? We’re in the classic and it’s just central crisis which is really what you’re talking about here. It’s not a crisis of happiness, it’s not a crisis of love, it’s not a crisis of money, it’s a crisis of meaning. So when you stop asking okay what’s going to make me happy and say how can I add meaning to my life, what happens is a couple of things. One meaning is a metric that you can build and create an enduring business, meaning it’s also something that you can develop and cultivate even when you’re not in your happiest moods, in fact sometimes deep suffering becomes a profound source of meaning. At the same time when you pursue meaning happiness tends to insulate as a byproduct of that pursuit and that so much help your way to pursue it. So for somebody who is sitting there and saying okay I’ve either built a cage of my own creation as an entrepreneur or I feel stuck in a job, I’m just not happy, part of the expression for me is, okay first feel back inside. There is a really good chance that you actually have no clue who you are, what matters to you, what lights you up, what your strengths are. So before you actually say okay like just start doing things. The first thing that you could actually do is spend a little bit of time in self discovery, so with my newest book how to live a good life there is a whole section I call contribution just basically about how you bring yourself to the world and what I haven’t said it explicitly, but it is set up, it’s like the first half of that whole section is really a whole bunch of conversations around ideas that are about self discovery, self knowledge. The second half is okay now that I know a little bit more about myself and who I am and what matters to me, how can I move that on to the world and start to apply this, how can I actually interact with the world. So if you’re stuck at a job, you’re not going to know how to get unstuck until you know who you are, what matters to you and what you care about and then at that point you can start to say, oh now I see why I feel this way and now I have a much clearer picture of where the misalignments are, the lack in fulfillments are and now I understand where the focus of what to do to resolve this. The truth is that many people actually don’t have to leave a job to feel better, to find more meaning, to get happier. They just have to know all about themselves which is really good news if you’re in the middle of your life and you have responsibilities and a family. People think they have to blow it up, but very often they don’t. Steve: You said a lot of stuff there and actually it kind of parallels my life. I just actually recently quit my job, I had been extremely happy working my day job in addition to all these side businesses and it was just recently that I realized I want to spend more time with my kids and so I just finally pulled the trigger, but it was just a very gradual process, nothing huge, I didn’t blow anything up. Jonathan: Yeah and for most – it’s interesting for I tend to be actually a little bit more of a seller than the average seller, so I’ve blown things up in the past, but I also I’m fast to let people know my example should not necessarily be your example, because most people are actually not wired the same way that I am, and also most people over estimate the speed at which they’ll be joined for in their next iteration and how joyful they’ll be, and they underestimate the pain of the disruption that will be caused by blowing things up. So the big advisory there is you may have to actually do that to go to where you want to be but that may be part of your process. But if you don’t have to I think it’s so much better to take the path of seeing if you can optimize your current reality particularly watching it first before blowing it up. There is a whole [inaudible 00:24:43] as long as it’s not a job [inaudible 00:24:45] that is actually researched and published and documented that describes how all sorts of things that you can do to potentially redefine the job that you have or redefine the role that you have or redefine the path and make it your own without having to leave it, and sometimes at the end you’re like you said [inaudible 00:25:04] and I optimized it and it was good and it was just time I really know. At the same time what you did was you built the next step on the side to a point where it was very easy to just kind of transfer laterally into it without having to go through the pain disrupting, and for most people even if you do make a decision that I have to leave, that’s very often serve the most bearable weight there. You know here’s the thing, I get a lot of emails also from people who and again this is kind of where you were talking about where people have problems finding their strengths. They’ll say, “Hey Steve I don’t have any particular talents to give to the world, I can’t think of anything that will make money.” What are some of the exercises that you would prescribe to kind of help people figure these things out? Jonathan: Yeah first separate those two questions like I can’t figure out what are my strengths and what will make money, because if you try and answer that within the same continuum you’re pretty much always going to lose, because if you have a strength where there is a very clear conventional path to make a living doing that, that’s awesome. But some people do but a lot of people don’t and then what they do is instead of saying, well this is my strength but there is no conventional path to earning a living, so I’m going to try and brainstorm and figure out unconventional paths. They actually tell themselves well this can’t be my strength then because it’s not going to make me money and they invalidate that strength which is massively destructive, because then they will write out themselves and say, I don’t really know what my strengths are or what my gifts and abilities are because they can’t make any money and that’s not a metric. They are your strengths and capabilities whether they generate money for you or not and may end up being the thing that you can build a career or a company around, and at the same time they may end up not being the thing, they may end up being the thing that you do on the side, and increasingly I feel like that’s okay. As long as you understand, really understand what they are, they don’t necessarily have to be the thing that earns you, that becomes primary source of income for you. If they are that’s great, that’s really the holy grail, hey I wake up in the morning and the thing that allows me to fully utilize my strengths and abilities and feel lit up is also the thing that allows me to earn everything I need to take care of myself and my family, that’s fantastic, that’s not always possible. So the question sometimes becomes, okay how do I get so committed to my life in a way that makes me okay – I mean if the thing that lets you earn more than anything on earth is being a parent, we don’t derive a paycheck from that. But if you feel like the god of the universe or whatever is putting you here because you have this astonishing gift in parenting and that’s where you’re feeling lit having reached below this, that’s fantastic and if at the same time you’re somebody who has to generate, who has to contribute to the family income, there may be a way to somehow figure out how to leverage that but there may not. So having the option of saying okay I’m going to create a way to generate an income that’s fine, it’s okay. That doesn’t empty me out, but it’s also not the thing that makes me utterly lit up but it makes me baseline okay, it makes me feel like I’m not struggling and stuff in my life. I’m not just constantly reacting from a place of scarcity and fear, and that allows me to then go home and be really doing the present in the thing that does light me up and then what I do believe is my greatest contribution which is my role as a parent. We’ve invalidated that especially in the entrepreneurship world especially in the online world, we’ve invalidated that option, we said that is not okay. I think we do a massive disservice with people who don’t know their lives, ideally not because they do believe that is the best option. Jonathan: Yeah and if you can that’s fantastic, to me that’s the best, the first line, but what I’m saying is allow the possibility that that is not actually going to happen. So I would say like, okay so you guys I mean the original question is how do we figure out our space and my gifts or whatever is my capabilities. So there are a couple of different tools, in the book I talk about two different strength successes. One is called the VIA strengths inventory and the other is something which is more common that people know about which is strengths under [ph]. Those are great tools that you can use where you literary takes you about 20, 30 minutes to take normal assessment. One is [inaudible 00:31:17] and they will give you really good sense for those things that really – you feel like when you contribute to the world, when you live, when you act in the space, you really feel connected, you feel a big sense of meaning and joy. You feel lit up. At the same time there are sets of ways to live [inaudible 00:31:36], think about it; take yourself back to when you were nine years old. Forget about when you were getting a PHD, we don’t need that. Then just ask yourself what did I do, what did I do that I loved, what did I watch that I just couldn’t get enough of. I talk about in the book these things I call the spots, the five hidden spots, and one of them is what is called things to do is figure out what is your spot or what are your blinded spots. So the first stops are purely [inaudible 00:32:03] you have a burning question, are you’re willing to solve a problem, what is fascination, is there an interesting topic or field or something you’re deeply fascinated by. Three is – I’m in a blank on this, right? Jonathan: Three is – so if we go through them, three is immersion, an immersion of an interesting activity that you love to be immersed, it’s like you’re getting to that first state when you do. You don’t do it for any other reason, you’re not trying to solve a problem, you’re not thirsty about how to do it, you just love doing this thing, you feel alive when you do it. Four is a mastery spot; you are most lit off when you’re pursuing progress, when you’re pursuing mastery in something. You find this as a service spot; you’re most lit up when you’re being in service of some other being even if that being is an animal or nature. So most of us have a [inaudible 00:32:52], we also have one that’s really struggling to dominate, so ask yourself, go through those five, then say okay what are my spots and what is this spot that really lights me up that I tend to always live by. And then start to dig out, okay is there some conventional way, is there some conventional path to build my living on a business around the ability to be engaged in those spots and my strengths. For many people there will be an answer, for some there won’t be an answer and then the idea is, okay I’m convinced here and that’s where you just start getting creative and seeing that there is a brainstorming. Not so many people will get all sorts of different opportunities and testing next. So to me that’s more the process, when you allow people to get to where we’re like yeah I had it figured out either conventionally or unconventionally, I was in the dial that in. But some people will still get to that point and they’re like, you know what I know what lights me up, I know what my strengths are, I know I’m simply being [inaudible 00:33:54], I know all these things and looked at the conventional path, and there is not a path there. I’ve seen a ton of time looking unconventionally and I’m not going to give up on that, but I really just don’t see it yet, and does that mean that I’m just doomed to live a life where I’ll never serve and never light up, there is no meaning? The answer is no, but the answer is it may not be the thing that is your primary contribution to your livelihood. It may be the thing that you end up doing on the side. There is a fascinating book called Daily Rituals and this is the book that actually mark the Daily Rituals of many of the greatest creators of all time from artists, computers works, painters, across all the different things. There is a really interesting pattern that emerges in that book which is that many of the greatest writers; artists of all time did it on the side. They had a regular nine to five work a day jobs and they never dreamed of quitting those jobs. And here is the reason why because if they quit the jobs, then that would put an immediate pressure on them to have to figure out a way to make their side in spite of the odds, generate a full [inaudible 00:35:08] living. And that would start to put a lot of pressure on them to start to commoditize what they’re doing rather than allowing it to be a full and genuine expression of who they are without regard to whether it’s going to generate money for the family, and they didn’t want to unstring themselves by doing that. So when you look at – there are just too many examples of people who have contributed on extraordinary levels lived greatly by being really happy in like making their primary contribution, the primary thing that lit them up, making that happen not during nine to five but five to nine and on the weekends. Seeing that over and over has really shifted my lens on validating that topic, it may not be the first path that you try to explore, but you may find that that is the path that you’re in, and to me if you asked me five years ago I’d probably say don’t keep pushing. Increasingly I don’t believe that, increasingly I believe that is a viable offer to establish. Steve: You know one thing about your book which I actually read last night so it’s very fresh in my mind that particularly resonated with me was your emphasis on travelling in the slow lane from time to time. This is actually a revelation that I recently had because I was looking at my ecommerce business and this entire time I’ve been trying to just grow it and grow and grow it. Whenever you grow something, that comes along with more employees and just more headaches and I asked myself, we make enough money so why do I continue to make my life a lot more complicated. That particular section really resonated with me, what is your way of thinking about it in terms of just travelling the slow lane, and when did you come to that revelation for yourself? Jonathan: What I realized over the years is that for me on a very personal level complexity deconstructs and stress equals pain, and so probably what I really shifted my value set to do says, how do I scale a path while minimizing complexity? That’s what I’m about right now and it’s not an easy thing to do and it’s an inspiration so deeply in. But for me because I know complexity brings stress and stress is something that is just deeply negative in my life, I’m always trying to figure out, how do I dial that, I always simplify. How do I springboard? So if we can automate stuff instead of adding inventory or keep talking to a process we’ll do that. If there is a way to take an idea and strengthen around in a way that minimizes complexity we’ll do that. That said, at the same time I’m also deeply aware of the fact that human connection is really, really important and commoditizing knowledge even though it scales really easily often does not have any real impact of bringing people together and creating environments that help develop relationships and that has complexity. So we’re constantly balancing things out with what we do, we try and say, okay we want to build impact, we want to create engines of impact and engines of connection breathing along and at the same time is there a way that we can do it that minimizes complexity and maximizes simplicity along the way. That doesn’t mean that we’re going end up with something simple but hopefully may end up being simpler. We mention speed and what I’ve realized also is that speed is very often not – we tend to move really quickly, we know that we can do faster if we move than more productive the more we get done. What I’ve realized is that we tend to all have a threshold where if we start to move faster than that, we create the illusion of getting work done but our error rate as you start to get back to the level, we have to start to re-trend and go back and fix. That makes us even have to move faster because now we are in — part of the reason we have to move faster is because we are creating errors by our speed that we have to go back and fix which creates a sort of distracted silo. Not only does it not help us create our best work, but it makes it feel really bad along the way because literary we’re just rushing faster and faster and faster making more mistakes, spending more time fixing rather than creating, and we’re not making progress on our primary metrics. That to me, that’s not a business we’ll build or let [inaudible 00:39:53]. Steve: You know that’s funny, that example that you just gave is something that I’ve encountered when I was coding my sites. Like I would just try to get – pump something out and just get it out right away but then later on have to rip it apart entirely when I want to add some sort of new feature. And just by slowing down and just doing things at a deliberate pace and doing it correctly often works out much better in the long run and I’m happy as well. Jonathan: It’s so much more fun also. I mean dialing is not bad even just 10% very often makes – it’s a leverage to do, because if you’re dialing back 10% your average probably going to make up for the drop in speed, and at the same time the joy you will experience with the process by dialing back just 10% is probably going to double. So this is like a really simple idea that needs [ph] some really big keywords. Steve: Let’s talk about something else that resonated with me as well which is kind of related to what we’re talking about here which is the notion of prioritizing and saying no, like early on I had lots of problems doing this and it was just recently within the last couple of years where like if something is not floating my boat I will just say no right off the bat. How does one come to this state of being able to say no? Jonathan: Yeah brutally and fixedly [ph]. After having so like being beaten down a lot by just like being sort of – because we’re taught as kids not to [inaudible 00:41:19] to speak on, you get it like be helpful, be of service which is all awesome and at the same time we know there will come a time where so many people are asking so much of you that to say yes to everyone and to tell them that for every single request means that you have to start to say no to all the stuff which is deeply meaningful to you, and which is the stuff that really matters in your life, whether it’s the relationships or the moments of peace and stillness or the creative project you’re dying to work on or nearly completing that you want to start to do on the side or building your own company, whatever it may be. The interior starts to gain the ability to say no, you’re essentially saying no to all the stuff that matters to you instead. Steve: What are your rules for saying yes? Jonathan: My rules eventually it’s got to be hell yes or it’s no. Steve: Why did you take this interview today? Jonathan: Because a mutual friend introduced us and she’s a hell yes to me and I like her. If you’re a friend with her then it’s got to be a hell yes. Plus I was just – I’m really fascinated because I had that statement where I was like should I talk to the student like background 2008/ 2009 and I’d really love to find out what he’s up to and it sounds like it could be a fun conversation. Steve: Well those five words that you did write back to me were very powerful, so try and freshen your mind. Yeah I know I was just curious so yeah just when you say yes it’s a hell yeah, but there is a lot of times when – I’ll give you an example of my own life. Just recently someone asked me to coach my daughter’s soccer team with them, and then someone else asked me to coach the basketball team and then the soft ball team as well and I couldn’t say yes to all those things or any of those things without worrying about my son as well and he’s got these three sports teams as well. So how do you figure out, what is your criteria for saying yes to something? Jonathan: For me it’s largely, it’s kind of funny; it goes back to what we were talking about earlier. It all starts from deepening just self knowledge first, so you can’t be able to say yes or no to them until you actually know what you care about, what matters to you. So like for the example that you gave, like okay so I got two kids, each kid has three sports and for each of those sports I’m being asked to coach so we have six sports that needs a coach. If I say yes to all of them I’m going to do a terrible job with all of them and then I’m not going to be able to do some of the other work or be there with my wife, I’m going to be really [inaudible 00:43:46] and get to show up on behalf of everything. So in the name of actually being to all of them, honoring my – maybe you have a deeply held value that I want to be present and engaged and positive in the lives of my kids when I’m with them. If you want to honor that you’re like okay so there is no way I can do that while I’m saying yes to six things. So what’s the maximum number of things that I can say yes to and still honor my values and what I know to be my strengths and the things that let me [inaudible 00:44:15]. You think, well I can say yes to coaching one, being a coach for one of my daughter’s teams, and being coach for one of my son’s teams. That will allow me to be present and when I’m present I’ll really be there and be entirely focused, and at the same time every week I’m not there, it’s for me to focus on my honor and put relationships and let it be other things that light me up. Or maybe it’s two, maybe it’s whatever it is for you, but for me there are two parts of it. One is actually learning how to say no and with understanding and compassionate and respectful, but the other one is honestly you must say yes and no to, it’s really about understanding who you are and what matters to you. So it’s like what lights you up, what empties you out, what do you really value, just say to really have values and believes. So like I said if your value is it’s really important for me to be present and engaged in the lives of my children, then that’s going to change the way you answer the question you just told us. If you stated your value around family definitely where if your value around family is to provide financially for the education, university education of my kids, that’s your primary family value. You’re going to choose very differently when you have this opportunity to coach, because you’re going to say no, probably you must say because you think in your mind, okay to honor that value what I really need to do is make more money so that I know that my kids will go to whatever college they want to go to and just be able to focus on their academics and not the play. It comes back to again spending some time on understanding who you are and what matters to you. Once you do that then the hell yes and the no is actually pretty easy, because it becomes pretty obvious to you once you really touch down on what matters on you. Steve: That’s interesting, these decisions are always very difficult for me because I feel like I have overwrapping interests, like I want to be a parent but then on the flip side there is other things that I need to get done as well, and so it’s never black and white for me at least. Jonathan: Yeah but at least like I know if you really know yourself well, you’ll understand what your big – so it may not be – you may say well [inaudible 00:46:39] you’re supposed to love to do that and at the same time if I do that it shouldn’t be upsetting, I can still spend less hours a week on my business which is going to make my family financially okay, and that actually would have more of a negative than the positive of you being present for that one. So it’s a tradeoff but at least if you understand what your values are so that you can feel confident in what better place to make more I think much more intentional decisions rather than just [inaudible 00:47:06] after. Steve: Would you say that a lot of the people that contact you saying that they don’t have enough time to pursue something, would you say that those people just have a problem of prioritization and not understanding what they actually want to get out of something? Jonathan: I would say a lot of them. I wouldn’t say a universal blanket, but I’ll say a lot of them, there’s a tremendous in other ways, there’s a tremendous amount of creativity in the way that we live our lives and tremendous lack of intentionality. And again I’m saying understanding what to say yes and no to. But I also want to point out another case which is that there are all sorts of people who are in a point of life where things are just hard, where circumstances are a big part also but they have locked them in a place where they got to work three jobs to take care of their family, and I don’t want to belittle the reality of that person’s life and say, oh that’s just not a priority. Jonathan: For many people it is, but there are also other people where I was like you know what there are just things that are brutally hard and it is genuinely something that’s just a really, really tough scenario without a lot of really clear easy ways out of them, it will just take a longer 10% of [inaudible 00:48:30]. Steve: Hey Jonathan I want to be respectful of your time, we’ve been chatting for like 45 minutes at this point. I read your book last night and I thought it was fantastic and it’s actually really quick and easy read, where can people find more about your book and more about the Good Life Project, and just more about your back story? Jonathan: Sure, so if you go to goodlifeproject.com you’ll find details of the book and then the book is available pretty much at book sellers all over the place, online, offline and my back story is probably in there somewhere. But thank you so much for inviting me on this, it’s been so much fun kind of reconnecting with you and to your audience thanks so much for listening in and allowing me the space to share some time with you. Steve: And right now everyone who is listening the book is 99 cents, I think I got it for 99 cents which is a ridiculous deal. Jonathan: I know, my publisher really put the eBook version on sale for 99 cents. Right now I’m not entirely sure how long it’s going to be there, but it’s kind of insanity because this is a traditionally published book that usually costs a lot more than that. Steve: Yeah, no brainer guys, no brainer, it’s How to Live a Good Life by Jonathan Fields. All right Jonathan thanks a lot for coming on the show, I had a blast man. Jonathan: Thanks a lot for inviting me. Hope you enjoyed that episode. Jonathan is really an amazing guy and you really have to go and actually check out his writing to fully comprehend what I mean. For more information about this episode, go to mywifequitherjob.com/episode155. And once again I want to thank privy.com for sponsoring this episode. Privy is the email capture provider that I personally use to turn visitors into email subscribers, therefore email capture, exit intent, and site targeting tools to make it supper simple as well. I like Privy because it is so powerful and you can basically trigger custom pop ups for any primer that is closely tied to your ecommerce store. And if you want to give it a try it’s free, so head on over to privy.com/steve, and once again that’s P-R-I-V-Y.com/steve. I also want to thank Klaviyo which is my email marketing provider of choice for ecommerce merchants. You can easily put together automated flows like an abandoned cart sequence, a post purchase flow, a win back campaign, basically all these sequences that will make you money on auto pilot. So head on over to mywifequitherjob.com/Klaviyo, once again that’s mywifequitherjob.com/Klaviyo. Now I talk about how I use these tools on my blog, and if you’re interested in starting your own ecommerce store, head on over to mywifequitherjob.com and sign up for my free six day mini course. Just type in your email and I’ll send you the course right away, thanks for listening.